RSVP in a comment below for address and directions. Be sure and leave your email. Join Mystery Readers NorCal for an evening with award winning mystery writer Jeff Siger in Berkeley. Jeffrey Siger practiced law at a major Wall Street law firm and while there served as Special Counsel to the citizens group responsible for reporting on New York City's prison conditions. He left Wall Street to establish his own New York City law firm and continued as one of its name partners until giving it all up to write full-time among the people, life and politics of his beloved Mykonos, his adopted home of more than 30 years. 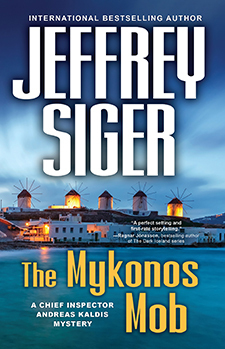 The City and County of San Francisco awarded him the Certificate of Honor citing that his "acclaimed books have not only explored modern Greek society and its ancient roots but have inspired political change in Greece." When not in Greece, he enjoys his other home, a farm outside New York City. 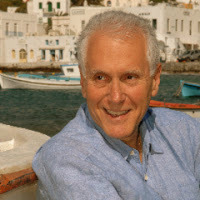 He has written 10 books in the Inspector Andreas Kaldis series. His latest is The Mikonos Mob. Jeff served as Chair of the National Board of Bouchercon, the world's largest mystery convention, and as Adjunct Professor of English at Washington & Jefferson College, teaching mystery writing.